©2016 Carolyn A Pappas, White Christmas at the Château. Watercolor and white gouache, 8 x 8 inches. Recently I got the chance to work on some album artwork for my good friend Robert Louis. He just released his brand new collection of instrumental jazzy Christmas songs, A Robert Louis Christmas. I’ve been playing it in the background and wishing for the semester break. This was a fun and challenging painting to make with all the architecture, snow and monochromatic values. I love winter scenes! Check out Robert Louis on facebook, listen for free on SoundCloud, or download the album on cdbaby. What a strange weather day this past Sunday was! I woke up to heavily falling snow and even lost power for a time. By midday, the snow stopped, fog was rolling in over the lake, and the wind picked up—blowing into my house at a 90 degree angle. By late afternoon, most of the snow was gone and the sun had returned, but the wind was still wild and the waves had whitecaps. I made this sketch using Derwent Watercolour colored pencils, which I haven’t picked up in a few years. I really got lost in it for a time, and enjoyed myself immensely. 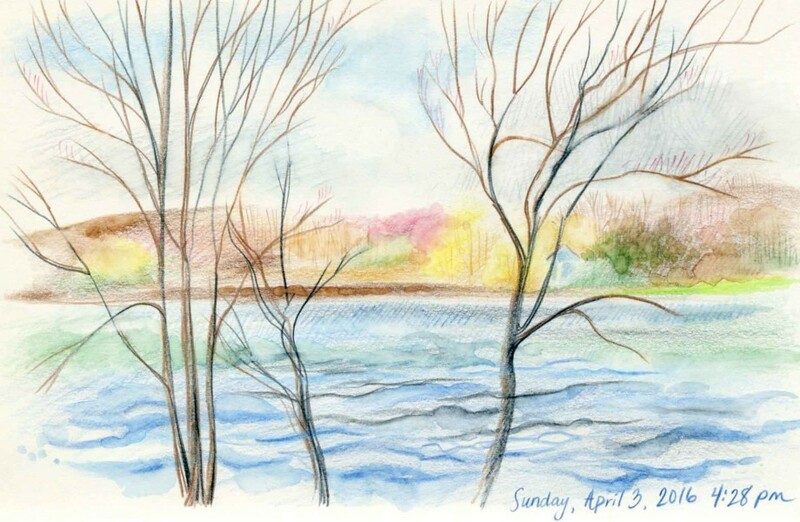 ©2016 Carolyn A Pappas, Lake Sketch (4/3/2016). Derwent Watercolour colored pencils in large moleskine sketchbook. The blizzard we had yesterday turned out to be a blessing in disguise, an extra day off work and time to spend inking and watercoloring. I made the picture below, plus got a good chunk done on something else which is in progress. I had fun experimenting with the circular format (4 inch diameter) and now my little card is on its way in the mail as an after Christmas thank you note. 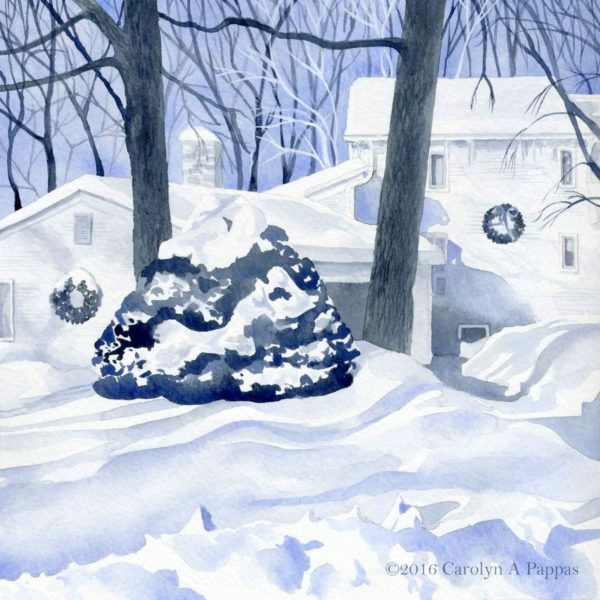 ©2015 Carolyn A Pappas, Snow Trees 1. 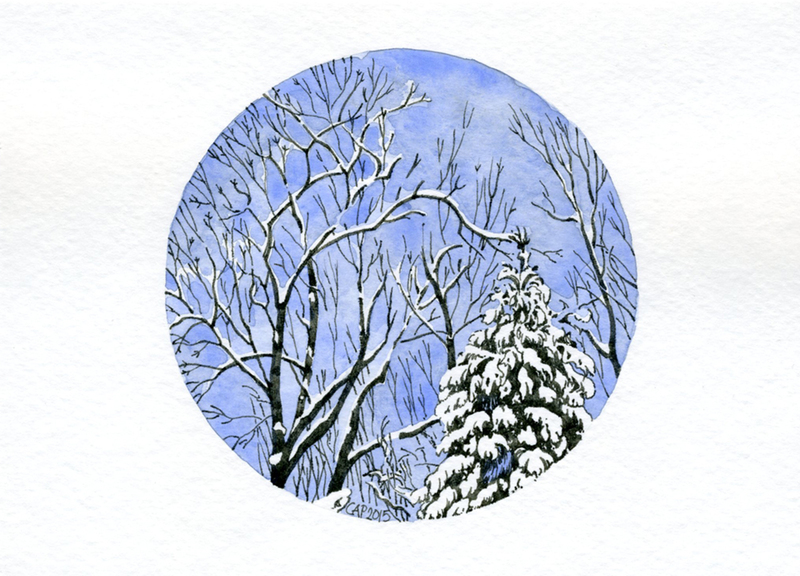 Ink and watercolor on 5 x 7 inch greeting card.